The Coat of Arms of the Most Rev. Mark L. Bartchak appear on the right hand side of the shield. Three symbols appear on a field of gold, each with special significance to the Bishop. At the top, an anchor — the traditional Christian symbol of hope — is flanked by two Easter Lilies, symbolizing glory and resurrection. Together, the anchor and the lilies refer to the Bishop’s Episcopal Motto: Christ our Hope of Glory (Colossians 1:27). The bottom of the shield depicts the lion, representing Saint Mark the Evangelist. Saint Mark is the Bishop Bartchak’s patron saint; the Bishop also attended Saint Mark Seminary in Erie. Dividing the gold field is a blue wave, which is drawn from the coat of arms of the Diocese of Erie. Bishop Bartchak spent most of his life on the shores of Lake Erie. When paired with the symbol of Saint Mark, the wave is also a reminder that Christ is present in both the Word (Saint Mark’s Gospel) and the Sacraments (water). The arms of the Diocese of Altoona-Johnstown appear on the left side of the shild. The top half symbolizes the two cathedral churches; the hosts and chalice evoking the Cathedral of the Blessed Sacrament in Altoona and the mitre representing Saint John Gualbert, patron of the Johnstown Cathedral. At the bottom appears a cross taken from the coat of arms of the Servant of God Demetrius Gallitzin. The shield is divided by a black band with three silver discs, which comes from the coat of arms of William Penn, founder of the Commonwealth of Pennsylvania. 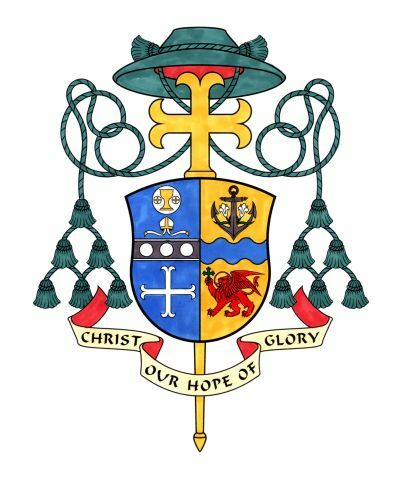 Mounted against a golden cross, the shield is surmounted by a green, wide-brimmed hat with six tassels, symbolic of a bishop. Bishop Bartchak’s motto appears on a scroll beneath the shield.